After building railways in Zululand in Africa for several years Engineer Christian Brinch came to Norway and applied for a job at Sam Eydes Ingeniørkontor (Sam Eyde’s Office of Engineering). His first job for the company brought him and his family to Odda and Tyssedal for a period from 1906 to early 1909. He then moved on to Norsk Hydro’s development at Lienfoss power plant, and Svelgfoss backup station in Notodden where he worked from 1909-1912. From 1912 until he retired in 1951 he was the Managing Director of Arendal Fossekompani (Arendal Waterfall Company). He also served several terms at parliament. 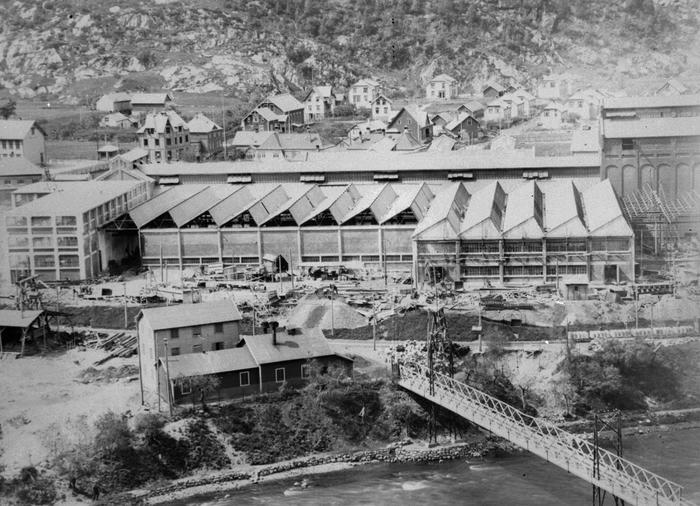 The power company Tyssefaldene was established to provide hydropower for a carbide factory that was to be built in Odda: 'Alby United Carbide Co.' which was led by Dr. Alb. Petterson. The name of the factory came from Alby by the river Ljungan in the borough Väst-Norrlands län in Sweden where the factory had spent its youth. It had been agreed to move the plant from Alby to Odda, where more power could be provided by the river Tysso. There was considerable English capital interested in ‘Alby’. Behind Tyssefaldene was a company of investors which consisted of Wallenberg (the large Swedish banking house), Eyde, Mayor Tilberg, and a Swedish gentleman by the name of Sacks. Allegedly Dr. Petterson was also involved. Hjorth (Kvaerner) had gathered most of the rights connected with the river Tysso. He sold these to the company. The plans for building the hydropower plant were made by Eyde’s office of engineering, in cooperation with 'Vattenfallsbyrån' (the Waterfall Bureau), a Swedish consultant company. The plans were basically to lead the river Tysso into a 4 km long tunnel up in the valley Skjeggedal, 420 meters above sea level. The tunnel went through a steep mountain side to the peak Tyssenuten, and from there through two penstocks to the power station by the Hardanger Fjord. This was something ‘almost’ unique in Europe. We had no real awareness of what was going on in America. Escher-Wyss (Switzerland) which delivered the turbines for the power station, claimed that they had experience constructing for this kind of water pressure, but that experience had to be relatively recently acquired, because the first similar plant, Brusio in Switzerland, was completed around the same time as ours. It was quite a daunting task to take on for a young man, but let me tell you right away – it ended well. From the bottom to a height of around 100 meters there was a fairly gradual rise, then came a slope of naked rock 150 meters high, and on top of this a 60 degree precipice which we had to blast through, above that again came what the people up there called ‘the field’, there the angle of the penstocks was merely 45 degrees. 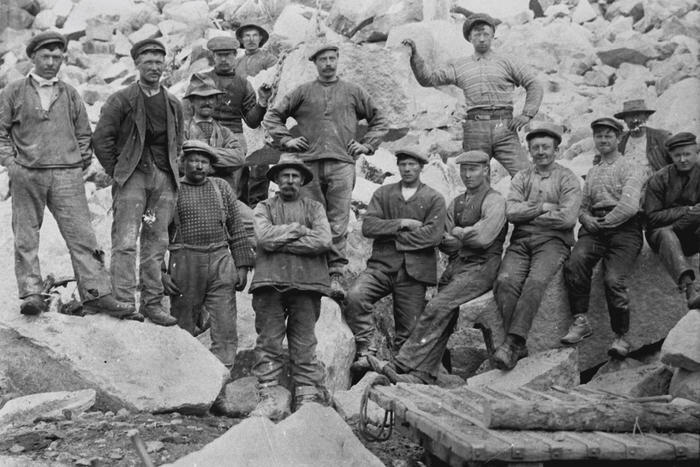 The workers were mainly men from the around the fjord, several of whom had worked on the mountain crossing of the Bergensbanen railroad: steady, good, clever people. There was little truancy on rainy days, but on top they kept me away when it was windy, which is understandable; it could be scary enough up there when the weather was fine. Many teams worked on the penstocks, and to keep them from blasting each other to bits we scheduled blast hours. The bottom team blasted off at a given time, and then they followed on upwards at five minute intervals. It was a virtually eerie terrain to work in, but fortunately we made it through the entire construction period with just one accident – a man broke his thigh bone: a mishap with a crowbar. It was something that could just as easily have happened on level ground. When we came to Odda work on the tunnel had commenced. 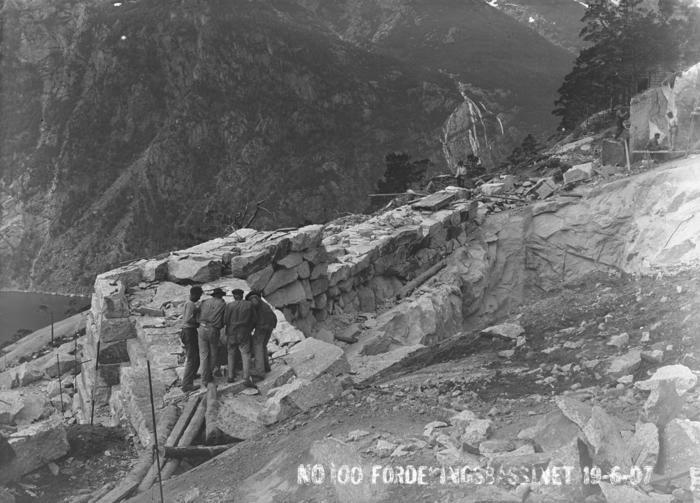 The necessary mapping, triangulation and measuring, which was no simple task in the steep terrain, had been excellently carried out by Per Ugland at Eyde’s engineering office. Everything fitted perfectly. The work had been contracted to Strøm & Hornemann – or perhaps to Hornemann alone. Strøm had supposedly left for a time to be head of Riksforsikringen (National Insurance), an institution he did not much care for as a contractor, because it caused a lot of extra work. Engineer Ragnvald Lie was employed to supervise the work on the tunnel, and the daily manager was Engineer Lyng. No houses had yet been completed in Tyssedal, so we temporarily settled in Odda where we enjoyed ourselves with some very fine people: the hosts of Hotel Hardanger Mr and Mrs Tollefsen, and people from the Carbide Dr. Petterson, the engineers Bruse, Rosengren and Haldin. As far as I can remember it must have been in late autumn 1906 that we moved into our own house in Tyssedal. 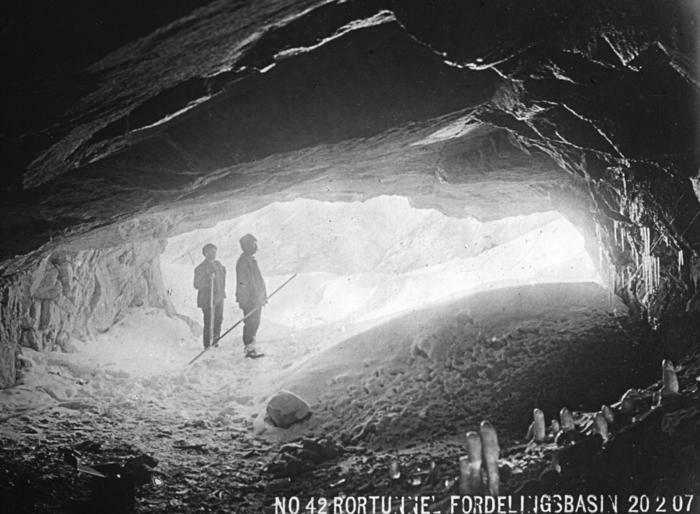 At that time the work on the plant was well underway, that is to say there was some disgruntlement over the progress of the tunnel, and in spring 1907 Hornemann got a settlement and Tyssefaldene took over the work. Instead of Engineer Lyng, Engineer Schult was reassigned to the tunnel and Engineer Lie took over the construction of the Samnanger Plant for Bergen Municipality. In connection with the settlement Director Scott-Hansen had come from Oslo. There was no railway across the mountain at that time, so he had to travel along the coast. In Arendal he picked up Consul Chr. Eyde. Their stay in Tyssedal coincided with Norway’s national day, the 17th of May, and we had some festive days together, which ended with a farewell dinner at Fleischers Hotel in Voss, whereto Lie and Mrs Lie and Rikke and I by invitation accompanied them. The work on the plant was on schedule and on the 30th of April, on the same day that Inger was born, we put voltage on the transmission lines to the carbide factory in Odda. Did higher powers guard the construction of the penstocks? 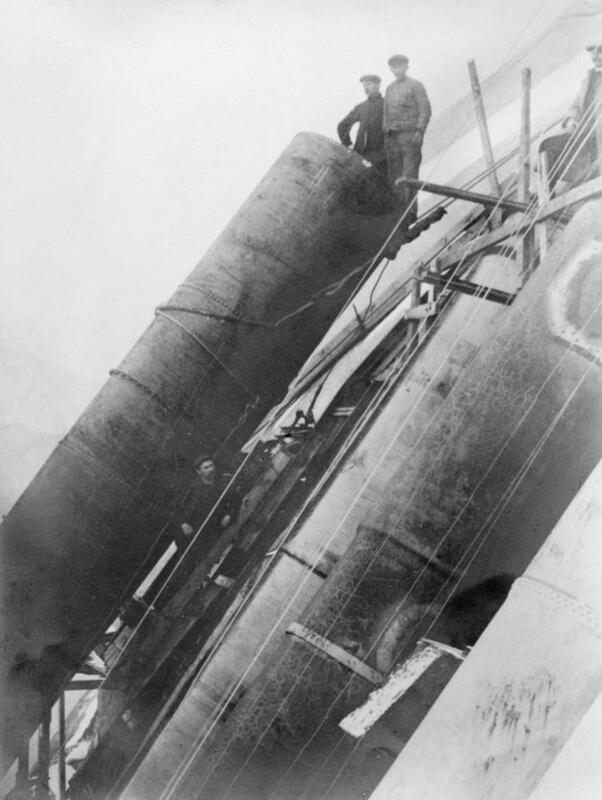 To resist the pressure of around 400 m the lower section of the penstocks were inch thick whole welded pipes. They were 5-6 meters long and weighed around 4-5 tons. One end was prepared to fit into the next section, and they were attached with a double row of rivets. All in all there were around 50 pipes of this kind: the thickness got less the higher up in the mountain they were intended for. 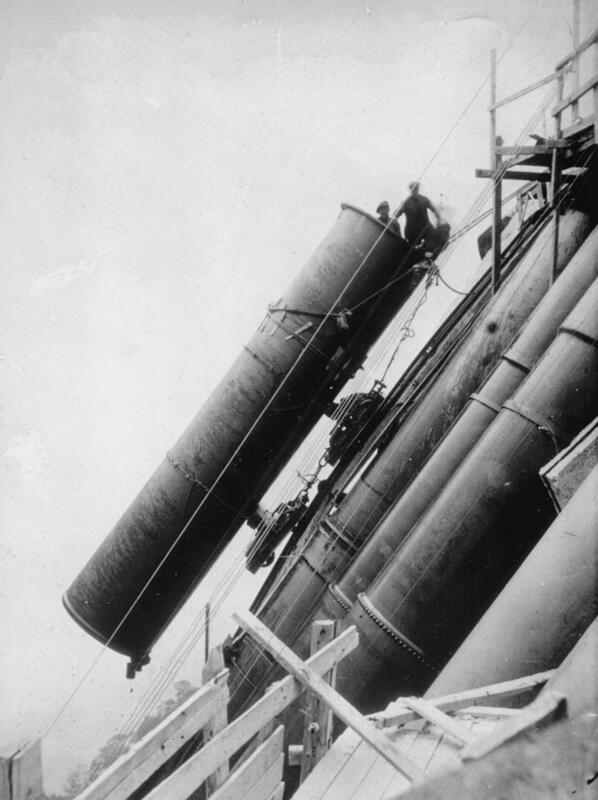 The pipes had been drilled and were ready to be riveted, and each section had been adjusted to fit at the workshop (the German Tyssen workshop). Further up in the mountain the pipes were not whole welded. The penstock sections were stored along the quay by the road to the power station. The work to assemble them was done by Moss Mek. Verksted (Moss Mechanical Workshop); each pipe was picked up by a crane and put on a funicular which ran along the penstocks to the top. During the first phase of construction two penstocks were made. All the work went without a hitch except that one of the welded pipes fell off the trolley, over the edge of the quay, and the end of it hit the rock below. When it was retrieved it was inspected and some strange cracks in the paint near the drilled holes were discovered. It turned out that the pipe had been drilled wrong, the mistake had been plugged and the pipe had been re-drilled. Because of this the end section of the pipe was practically loose. We hardly dared think about what would have happened if this section had been added to the penstock. We immediately assigned a reliable man to scrape and inspect each connecting section, but we found no other mistakes. That one pipe fell off the quay and hit the rock so hard that it revealed the mistake. We started to wonder if there was perhaps up in the mountains, underneath the Folgefonna glacier perhaps, a higher power that watched over us and made sure that everything was done correctly. It certainly was quite a strange case. In the first stage of development the machines were Pelton turbines from Escher-Wyss and generators from ASEA, these have through ordinary maintenance run until this day (1954) and are now to be replaced with larger aggregates. The first stage of development of Tysso was calculated for water pressure of 12 m3 per second, a number someone had reached based on Vassdragsvesenets (The Watercourse Directorate’s) observations of precipitation in the region. 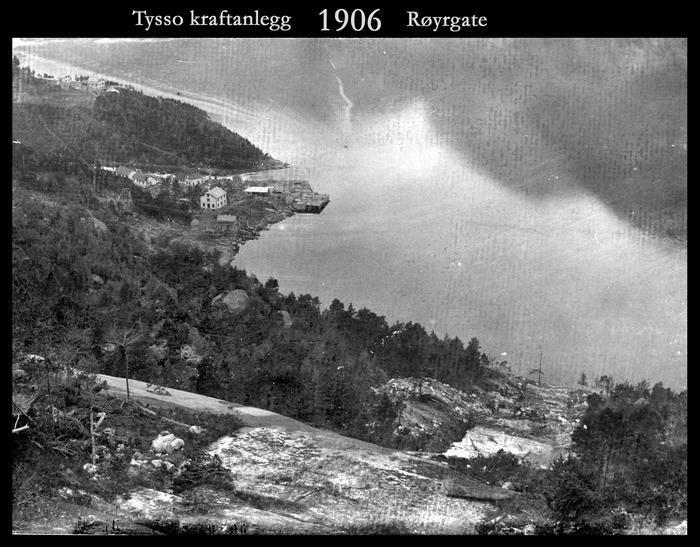 The measuring stations were however all so low in the terrain that one was not aware of the precipitation that was caught by the Folgefonna glacier, rain and snow in this part of the west coast largely comes with south western wind – it practically jumped across the fjord and came down over Tysso’s catchment area, which is 1500-1600 meters above sea level, bordering on the Rjukan area. We immediately began to measure the river Tysso, and concluded, it must be said this was a result based on just 2 years, that the correct number was around 25 m3 per second. The time span was of course too short to be conclusive, but at least it indicated that there was considerably more water in the river than what had been initially presumed. To explore the future opportunities of creating reservoirs from the mountain lakes, in the summer of 1907 I went on a measuring expedition, as the old maps were unreliable. It was the early half of July and in the lakes highest up towards the Rjukan catchment area I set my tachymeter on the ice. I had no more to do with these things as in the autumn 1908 – winter 1909 Eyde and the Wallenbergs pulled out of the Tyssefaldene power company, and I was offered work at the development of Lienfoss by Notodden, a plant I, together with C.W. Eger developed in the years 1909-1912. Tyssefaldene was taken over by Mayor Tilberg together with some Swedish banks and Ragnvald Blakstad became managing director. Through a larger expansion of Ringedal Lake as reservoir, creating reservoirs of the mountain lakes, and transferring water from a minor watercourse at Lofthus, Tyssefaldene has since expanded from around 35.000 to 120.000 HP. Besides there are plans to construct a Tysse II which is to have similar size and will be ”added” to Tysse I, which will exploit the drop from a mountain lake to the Ringedal lake. The Germans commenced this work during the war, but did not get very far. As far as I know the plans have been temporarily suspended. Tyssefaldene now delivers power to an expanded carbide factory, a cyanamide factory (fertilizer) and a large zinc plant on the west side of the fjord, just outside Odda. 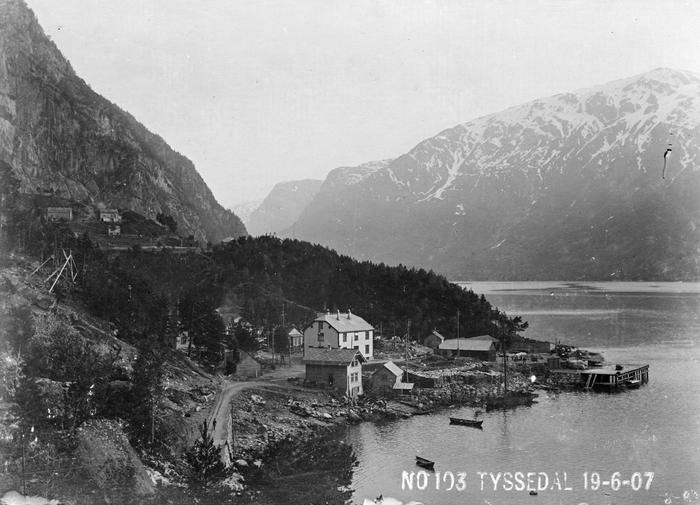 By moving to Tyssedal we were somewhat separated from our friends in Odda. The distance was 6 kilometres, and there was no road, but we had a quite good motor boat with a top, so the distance did not matter much, it was just that we had to go by sea. Before the factories were started there could be ice on the fjord, but never for longer periods of time. We were from the east coast and found the climate peculiar for Norway. I remember picking Mrs Tollefsen’s stemmed La France roses on the day before Christmas Eve 1907. But let’s have a look at the different types of people we came into contact with: First of all I’d like to mention my co-workers. Here I was unusually lucky, we all worked very well together. 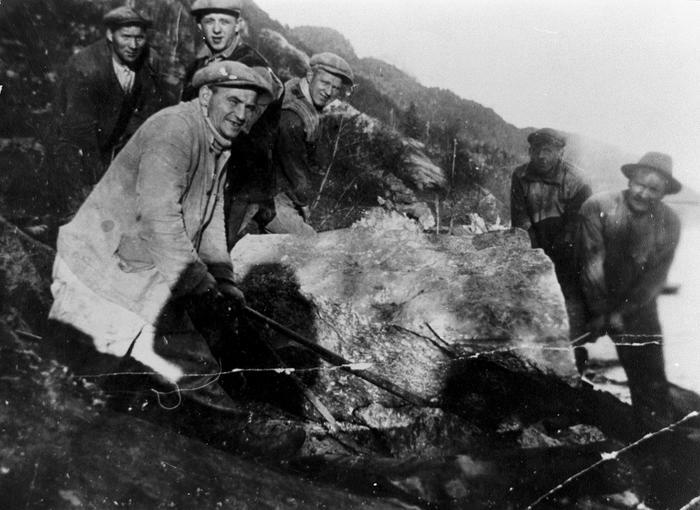 I have mentioned that we had steady, competent workers – largely ‘Haringer’, people from around the Hardanger fjord. The landscape along the entire inner part of the fjord arm Sørfjorden was steep, but just where the river Tysso ran into the fjord there was a small field. Here two rows of workmen’s huts were built, for the men who worked on the power station and the lower part of the penstocks. There was also a quite roomy dining hut, and a two storey combined office building and mess. With the necessary storage facilities etc. these were all the buildings by the mouth of the river Tysso. On the south side of the river a couple of houses had been built for the engineers, below the mountain Tveitenuten. In addition there was a house for the supplies and contracts manager and housing for a couple of supervisors, which later also housed a Swiss and a couple of Swedish fitters. Because of this the house was named Babylon. The people sometimes wanted to have a party, usually on a Saturday night and they had been told to first get permission from the office. There they were usually told that they were welcome to have a party, but they had to keep the drinking and noise in check, and that they had to arrange their own ‘security’ to make sure that proper decorum was upheld. On such an occasion a moonshine salesman had found his way in, and as it here as elsewhere were those who were overly fond of drink there is likely to have been sold quite a lot of moonshine. An average market price for the stuff had been established for ‘96% ’, but the thirsty soon found out that the purchase far from lived up to the ‘percentage’. They therefore ganged up 3-4 and decided to teach the salesman a lesson. The man had however obviously heard that attack is the best defence and armed with a pocket knife he charged the nearest one, and before anyone could stop him he had hacked a number of smaller and larger wounds both high and low on his victim. He was however overpowered and the police in Odda were alerted. We did not have a holding cell in Tyssedal. He was collected by motor boat and safe from any harm. But the poor ‘victim’, what was to be done about him? One in the pack, who had gone through a similar thing, maintained that they had to disinfect the wounds; otherwise ‘hurt could get in them’. They got hold of store keeper ‘Old Finne’ in the ‘hut’ and the only usable thing he had was Lysol. They were given a healthy portion of the stuff, and besides whatever there was to bind the wounds. The ‘victim’ was then washed with Lysol, wrapped in cotton and bound with gauze. And if anyone can imagine what it feels like to have Lysol put on open wounds, then they will realize that the poor man’s general wellbeing was virtually zero, if not less. Yes, poor man. Finne came running to my house, pounding on the wall, it was in the middle of the night too, and he shouted that I had to come sort them out ‘because now they are killing each other’. I got him to wake my neighbour, the supplies and contracts manager, who had been with the police department in Oslo, and we went down to investigate. By then, however, all this was over and done with. As I mentioned I accepted Eyde’s offer to help develop Lienfoss by Notodden. When the first stage of development in Tyssedal was completed it was time to say goodbye to all our good friends in Tyssedal and Odda. It was sad to say goodbye, but I am glad to say that we have stayed in touch with many to this day: Engineer Lie and Bruse from the Carbide and not least Jersins whom we first met in Odda as a Carbide employee. Before we left Tyssedal for good we had gone to Lienfoss to confer with Eger about the plant. We had a spectacular trip back past Rjukan, Møsvand, Mogen, Argehøid, Normannslågen, Eidfjord (Vøringsfossen waterfall), Tyssedal. It had been raining terribly for days, so we regularly had to wade, even in small brooks you usually could get dry-shod across.